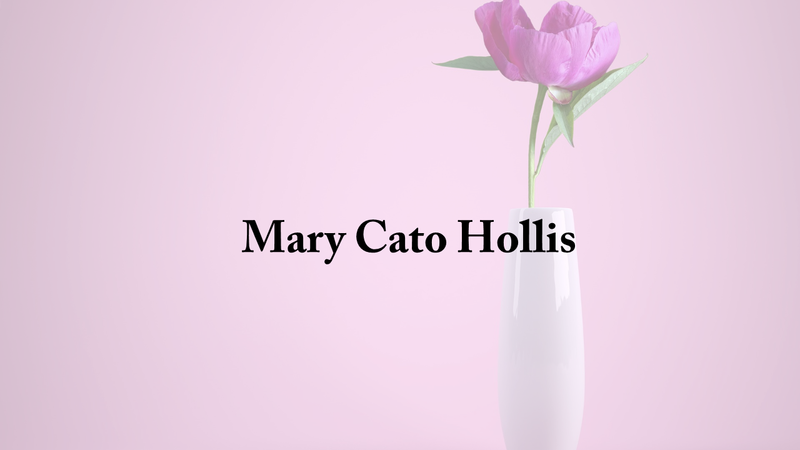 Mary Cato Hollis, age 79, passed away Feb. 28, 2019, at Hanceville Nursing Home and Rehab. Visitation will be Saturday, March 2 from 5-7 p.m. at Moss Funeral Home Cullman. Memorial service will be at 3 p.m. on Sunday, March 3 at East Side Baptist Church, Cullman with Pastor Matt Smith and Rev. Sam Hollis officiating. Visitation before the funeral will start at 2 p.m.
Mary is survived by her husband of 55 years, Sam; her son Paul Hollis (Jill); granddaughter, Elianna Hollis; brother, John Cato (Brenda); sister, Karen McDonough (Johnny); brother-in-law, Jack Berry; and several nieces and nephews. She was preceded in death by her parents, Grady and Sarah Louise Cato; and sister, Carolyn Berry. Mary was a faithful Christian serving alongside her husband in 55 years pastoral ministry. She excelled in ministry to children: directing children's choirs, teaching Sunday school and vacation Bible school. She was gifted musically: playing the piano, singing solos, singing in ladies ensembles and church choirs. She was a loving caring mother and grandmother. She loved her extended family, lavishing her brother and sisters, nieces and nephews with her generosity. She was a friend to all who would allow her to be. She will be missed, but our loss is Heaven's gain. Mary's family expresses its appreciation for the loving, compassionate, professional care she received through Hanceville Nursing Home and Rehab, North Alabama Hospice, Kindred Home Health Care, Dr. James Hoover and Nurse Practitioner Marsha Tillman. In lieu of flowers the family prefers that donations be made to The Gideons International or the Billy Graham Evangelistic Association. Online condolences and special memories can be left for the family at www.mossservice.com.